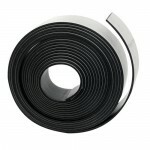 ADHESIVE MAGNETIC STRIP 19mm x 3MT .. Sheets (pre cut) 100MAGNETS PER SHEETThis sheet includes 100 peel off magnets Easy to stick to the back of craft projects, notices, and more! Each sheet has 100 pc of magnets pre cut to 45mm X 25mm. ..